The Catholic Archbishop of Tuam has called for a wider examination of the roles of the Church, state and society in relation to mother and baby homes. Archbishop Michael Neary said all aspects of life at the time should be examined, "broadening the focus from one particular religious congregation". He was speaking one week on from the discovery of significant quantities of human remains at a former home in Tuam. Almost 800 infants died at the home, but no burial records have been found. The children are believed to have died from natural causes, but the search for their remains has raised questions about the living conditions and practices within the institutions. Mother and baby homes operated across Ireland from 1925 to 1961 and housed thousands of women who had become pregnant outside marriage. The home in Tuam, County Galway, was run by the Bon Secours order of nuns and a child died there nearly every two weeks between the mid-1920s and 1960s. For the second time in a week, Archbishop Neary used his homily during weekend Mass to address what has become known as the Tuam babies scandal. He described the story as "deeply distressing" and said the report of high levels of mortality and malnutrition was "particularly harrowing". He added that it was an era when unmarried mothers were "stigmatised and ostracised by their own community and the Church". "How could the culture of Irish society, which purported to be defined by Christian values, have allowed itself to behave in such a manner towards our most vulnerable?" he asked. The archbishop repeated his apology for the "failings of the Church as part of that time and society when - instead of being cherished - particular children and their mothers were not welcomed, they were not wanted and they were not loved". But he added: "There is an urgent need for an enquiry to examine all aspects of life at the time, broadening the focus from one particular religious congregation, and instead addressing the roles and interrelationships between Church, state, local authorities and society generally. "Such an approach should ensure that the truth will emerge no matter how unpalatable it may be to those on whichever side of the present discussion." He said it was time for a thorough examination of Irish social history, so that mistakes are not repeated in the present or the future. "Even today there are huge challenges surrounding how we care for the disadvantaged in our society," he said. "In years to come, our present society will inevitably be subjected to scrutiny and will most likely be found deficient in many areas to which we are blind at present. "We need to learn from the past in order to prevent similar injustices in our time, and so as to inform our future generations." 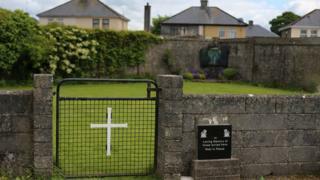 The Tuam site is being excavated as part of a government-appointed inquiry into mother and baby homes. The archbishop said he hoped it would "enable that truth to surface in a clear and objective manner". He prayed for "the light which will illuminate the dark recesses of that past and bring hope and healing to us all".